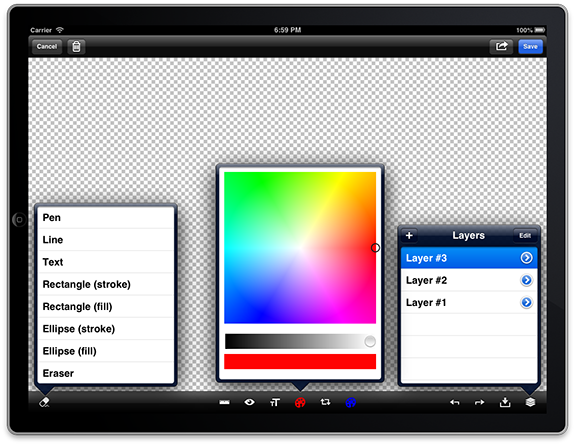 The drawing functionality of SimpleDrawing can be used within your own applications with minimal effort. The design of the code also makes it easy to add your own tools by inheriting from SDDrawingTool and overriding (usually) only one method. It is possible to use the drawing functionality of SimpleDrawing within your own project. First add the contents of the SimpleDrawing project directly to your Xcode project by drag-and-drop. Next, add the required frameworks: Quartz, Twitter, and MessageUI. Select the main.m file from SimpleDrawing and uncheck it’s “Target Membership” for your target in the File inspector. Finally, disable ARC using the -fno-objc-arc flag for the files BGRSLoupeLayer.m, BSBrightnessSlider.m, and RSColorPickerView.m. You can download the source code for SimpleDrawing at my repository here. UPDATE: The SimpleDrawing app is now available for free from the Apple App Store if you want a free and easy way to try the app. This entry was posted in Development, Xcode on October 23, 2012 by Nathanial Woolls (Nate). Hi. Have you ever implemented or tried doing something like dragging the drawings/strokes around? Thanks. Hi. Have you ever done something like dragging/panning a drawn shape? I haven’t though that’s a very interesting idea. If the shape were in its own layer that shouldn’t be too difficult to do. How would you go about implementing a zooming behavior. 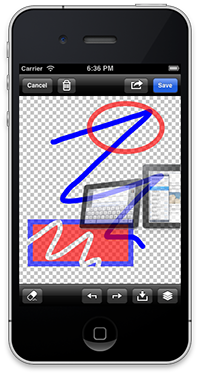 For example, what if the drawing canvas is larger than the actual device screen size i.e. 2048 x 2048 canvas. I tried to implement a solution, using UIView transform property, but i’m getting very poor performance — specially on the iPhone. I can’t import photo from gallery or camera? Any suggestion?